"The history of Derry, from the year 546, when, it is stated, a monastery was founded by St. Columbkille, up to the commencement of Elizabeth's reign, is chiefly ecclesiastical. In 1566 the first British garrison appeared in Derry. In 1568 the town and fort were destroyed by an accidental explosion of the powder-magazine, and abandoned by the English, but re-occupied in 1600, by Sir Henry Dowera, who erected the adjoining fort of Culmore; and to him, in 1604, James the First granted the charter for the establishment and regulation of the town. In 1608 it was again reduced to ashes, and the garrison put to the sword by Sir Caher O'Doherty. In 1613 the Irish Society was formed, and a charter of the town, under the name of Londonderry, granted to the 'Society of the Governors' Assistants, London, of the New Plantation of Ulster,' who were bound to enclose the city. After various complications and restorations a new one was granted by Charles II., on his restoration, under which the Irish Society now act. 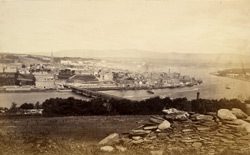 Although Derry had sustained two previous sieges - one in 1641, and one in 1649 - it is from the third and last, which occurred in 1689, that the city derives its fame. This siege, sustained against the armies of James II., which continued for 105 days, during which period the inhabitants were reduced to an extreme of misery that has very few parallels, even in the records of civil war. On one of the bastions of the wall stands an elegant monument, erected to the memory of the Rev. George Walker, the heroic defender of the city; it is a well proportioned column of Portland stone...The vicinity of Derry is fertile, and the surface agreeably varied by hills and prolonged valleys. On the north the hills blend with the mountains of the peninsula of Innishowen, and to the south they gradually rise to the high central mountain groups of the counties of Derry and Tyrone."